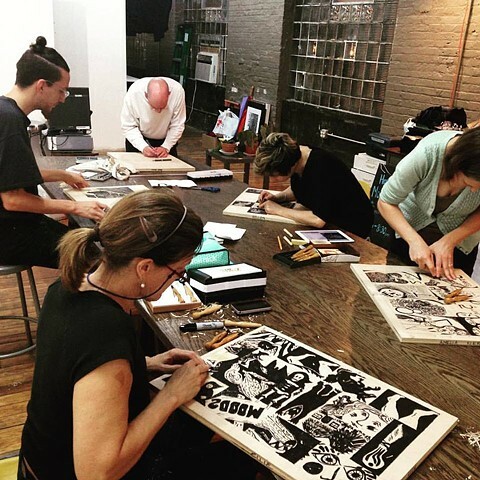 The Woodcut Challenge is a large-scale printmaking project. Artists are asked to use a special set of knives, called gouges, to "draw" into a 40x60'' piece of birch plywood. The block is then rolled with ink and transferred to a sheet of paper, or in this case, canvas, using a piece of heavy machinery (the press!). This technique, called Relief, was invented in China, used by Sumerian merchants, and popularized in the West by European printmakers in the 14th century. Relief printing has played a pivotal role in history, allowing for widespread dissemination of information—for example, the Guttenberg Bible and political broadsides by Jose Guadalupe Posada & others that critiqued the aristocracy and made it possible to organize grassroots labor movements throughout the world. 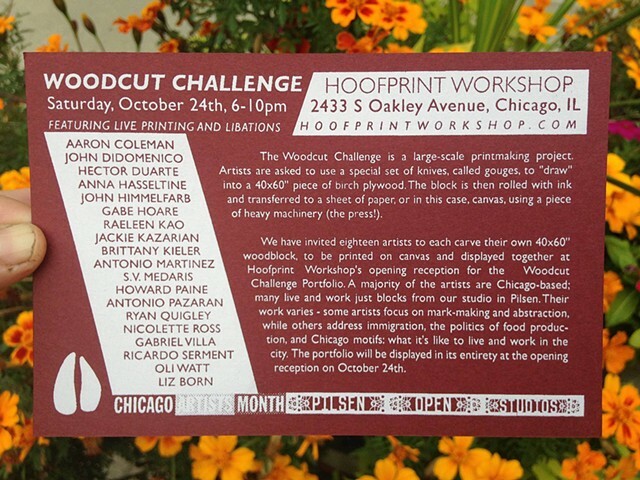 We have invited twenty artists to each carve their own 40x60'' woodblock, to be printed on canvas and displayed together at Hoofprint Workshop's opening reception for the Woodcut Challenge Portfolio. A majority of the artists are Chicago-based; many live and work just blocks from our studio in Pilsen. Their work varies—some artists focus on mark-making and abstraction, while others address immigration, the politics of food production, and Chicago motifs: what it's like to live and work in the city. The portfolio will be displayed in its entirety at the opening reception on October 24th. Prerequisites: None, Authorization: General Orientation. Guillotines. In this variation of our Intro to Relief Printmaking class, each student will conceptualize, hand print, and bind a complete artist book. This project-based approach will introduce all the foundational skills of relief printmaking, such as carving, inking, and printing a woodblock, as well as how to exploit positive and negative space in a block printed image. The flutter book format, a variation of an accordion-fold book, allows multiple pages to be unfolded and morph into many directions and contextual avenues. Each student will develop and execute a unique plan for his or her book project, taking into consideration image and text relationships, page imposition, and the basic principles of and materials for relief printmaking. 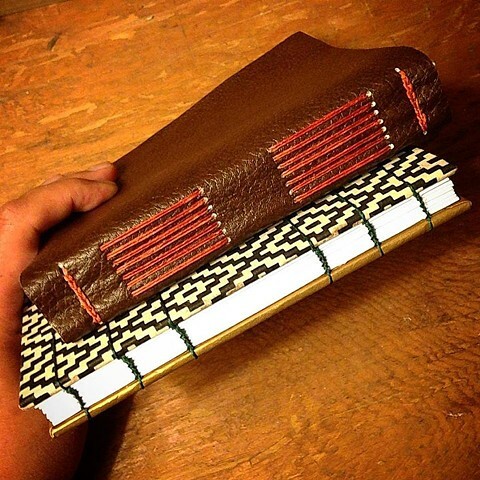 Bookbinding is a craft and art form that relies on a basic set of techniques, tools, and materials. 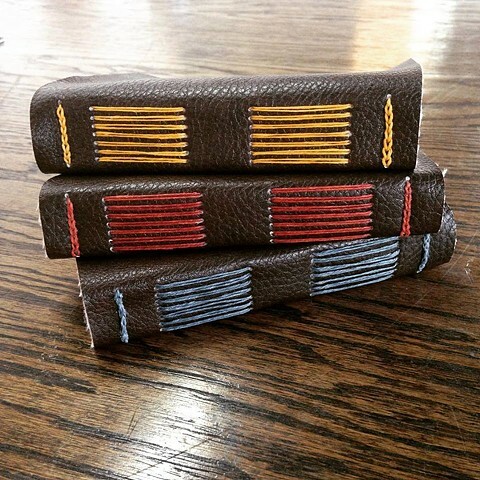 Once foundational skills are mastered, bookbinders can add creativity, content, and design to create unlimited variations of handmade books. In this class, students will create their own books from scratch. Students will learn pamphlet, “perfect”, coptic, and stab bindings, as well as modifications of these traditional binding styles. Projects will focus on on creativity, design, and craftsmanship with the goal that students are able to experiment with variations and incorporating content within the book through writing, simple printing tricks, and customizing paper for covers, inserts, or end-paper. Students will leave with a small library of hand-bound books to fill or use as templates to make even more books. A Clamshell box is a remarkably sturdy and useful structure that can be used as an ideal housing for a portfolio of prints, photos, artist books, memorabilia, or tools. During this workshop students will construct a 6&#8243;x8&#8243; clam shell box, and through this project, acquire the skills needed to make additional or customized box structures on their own. Students will also get to make a create “perfect bound” sketchbook to accompany their handmade box. To allow each student to create a box that suits his or her style, we will not be providing the decorative paper that will cover each box.